There is a "New Inquisition" being waged by hypocrites masquerading as religious authorities, and it is "new" because in certain ways it is similar to the original Inquisition waged by the medieval Christian Church against "heretics" who criticized the ruling theocratic imperial Church. 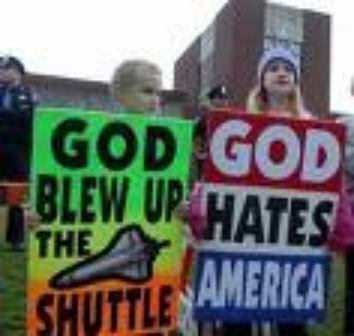 Thus the terrible state of our nation and world is in large part the consequence of certain people having not learned the lessons of history -- and instead are under the delusion that they are "doing God's will" by judging and condemning those they judge as "godless." It's not just misguided right-wing Christians. Their Jewish and Muslim counterparts are doing the same thing. That is why some of the terrible events in history have been repeated once again by hypocrites who claim to be religious. It shows how money and power can and does corrupt people, and the lust for power and money leads to much evil, especially when corrupt people claim, and perhaps even convince themselves, that they are patriotic and religious. The horrible tribulation, economic crises, partisan political conflicts and divisions, wars and most of the other disasters are the consequences of what the forces of greed and self-interest done over the last 30 years as they waved the flag, thumped their bible and rattled their swords. They do not understand that arrogance goes before a fall; that a house or nation or world divided against itself cannot stand; that it is best to refrain from offensive attack or retaliation; and that the humble, gentle, kind, peaceful people of the world shall ultimately inherit the earth. Those are basic universal truths, common to all people of conscience and good will, and common to all religions. Unfortunately, humble and gentle people cannot inherit the earth as long as proud and militant people fight for power, claiming and perhaps even believing that they are divinely inspired and entitled to rule in the name of religion. Having not learned the lessons of history and being misled by false shepherds and false prophets, they have been indulging themselves by waging a New Inquisition. That’s why we should be aware of the most infamous Inquisition, which was one of the darkest periods of Christian history. It was originally the "fight against heretics" which historians say was started in the 12th Century by the hierarchy of the Roman Catholic Church. It was horribly cruel and was marked by persecution, arrest, imprisonment and torture of those suspected or accused of "apostasy" (rejection of religious rule) or "heresy" (rejection of established beliefs of a religious organization, or adherence to "other beliefs"). The Inquisition spread to Spain and Portugal, and eventually it was not only Catholics who were guilty of such cruelty. Protestant Christian leaders also were guilty of theocratic rule, and the Inquisition then developed into what is generally known as "The Witch Hunts," which began in Europe and were continued in New England in America, which led to about 100,000 executions of those accused of being "godless." It was all initiated and caused by sanctimonious Theocrats who ruled under the cloak of religion and used it as justification for their cruel, authoritarian rulership. They condemned and labeled anyone who would not bend to their will as heretics or apostates or "godless pagans," or "godless heathen." Today, because of the rise of the "fundamentalist religious right" over the last 30 years, it’s much the same. There are spiritually blind Theocrats thumping their bible claiming to be Christians, who are doing virtually the same thing from behind their pulpits, on television and radio, and on the Internet. 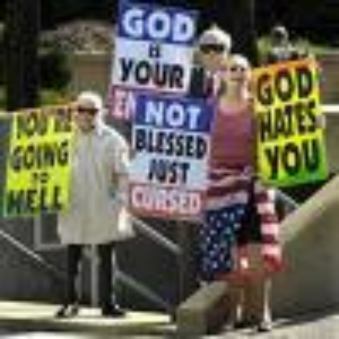 It’s become so bad that Equal Employment Opportunity Commission statistics show that religious discrimination complaints in workplace settings have more than doubled since 2000, and in 2010 about 3,800 complaints were filed about religious discrimination perpetrated by right-wing zealots who claim to be patriotic Christians. Of course, today the theocratic imposition and bigotry and hypocrisy of intolerant religious extremists is a big problem in many countries. There are proud, aggressive and militant religious leaders who call themselves Jews or Muslims that are causing all sorts of trouble too. But, here the focus is on the hypocrites in America who boast that they are Christians, because in judging and condemning people they not only ignore the core universal teachings of Jesus, but they ignore the intent of the Founding Fathers regarding religious freedom with freedom from Theocracy. As is discussed in other articles on this site, during the last thirty years in America we have seen the gradual but steadily increasing theocratic efforts of right-wing partisan zealots who feign Christian religiosity to try to gain political power and control of America, and even of the whole world. And in their quest and fight for political power they have maligned, slandered and falsely accused many good people who hold different views on religion and politics. This is said not to demonize misguided, bigoted Christians, because most of them think they are doing the "right thing." The mission of the modern son of man is to correct them, because the Spirit of truth comes not to condemn, but to educate; not to punish, but to correct; and not to destroy, but to save. Therefore, this prophesied judgment is to educate, correct and save them from charging even further down the road that can seem right to men, but leads to conflict, division, and ultimately to destruction. In the articles on The 21st Century Declaration of Independence, and Ignored American History it is mentioned how they have had a lot of success in their efforts to take over the U.S. Military, and how they even made being a Christian a litmus test for being a presidential candidate during the 2008 presidential campaigns, even though that is absolutely contrary to the intent of the Founding Fathers. However, in this article the focus is on the impact of their partisan ideological war against those who have stood and still stand in their way, because they have resorted to waging a concerted but misguided campaign of slander and deception. In the 1980s it was initiated by Jerry Falwell’s and Pat Robertson’s "Moral Majority," and it was against "secular humanists," "godless liberals," homosexuals, the American Civil Liberties Union, feminists, Planned Parenthood offices and clinics, homosexuals, anti-war demonstrators, and practically any others who would not march to their drummer. And during the last 30 years the number of leaders has increased, and their list of "enemies" has increased, to include Islam, Freemasonry (see the article on Freemasonry), and even other Christian denominations and sects that do not hold the same beliefs. During the last 30 years their words, actions and tactics have become more aggressive, more imposing, and more dangerous. From the killing of John Lennon in 1980 by a right-wing self-professed "born-again Christian," to the bombing the federal building in Oklahoma City in 1995 by members of the ultra right-wing "Christian Identity Movement," to other bombings and the killings of others who did not bend to the will of the "Religious Christian Right," it has become so bad that some have called the sanctimonious and bigoted hypocrites "The American Taliban." The "Religious Right" will, of course, deny the facts and claim that we cannot blame them for the actions of a few radical extremists. But, it is their radical extremist preaching of false doctrine and false prophecy that has actually caused it. Therefore, it may help people to understand how and why this happens by taking a good look at history, because the seeds of the first "Christian Inquisition" were sown back in the fourth century when the Roman Emperor Constantine "converted" to Christianity and adopted it as the official state religion of his military empire. That established the first Christian Theocracy. They began a long series of campaigns of oppression and persecution of everyone who did not swear obedience to the church's authority, and that eventually expanded not only in the Inquisition, but into the horribly bloody military Crusades to conquer and rule by force of arms, not only in Europe, but in the Mid-East to capture and rule Jerusalem. The problem then, as now, was a man-made doctrine of preeminence and superiority summarized in the Nicene Creed and established as canon law. And back then it went so far as to banish and condemn Greek art, philosophy, science and mythology, as well as all other religions and spiritual teachings. In the articles About Christianity, The Virgin Birth Story, The Martyrdom of Jesus, The Second Coming Story, The Resurrection Story and others, it is explained why that doctrine is erroneous, not compatible with Judaic (Old Testament) scriptures, and not compatible with the actual teachings of the Christ Jesus. But we really need to discuss the history and impact of that doctrine. We need to understand that the official church doctrine, creed and canon law, institutionalized in the fourth century, established the "Divine Right" of imperial Popes, and eventually of all the imperial "Christian Kings" of Europe, both Catholic and Protestant. But, for about eight hundred years the Catholic Popes ruled with absolute theocratic power and they plunged Europe into what’s called the "Dark Ages." Even though most Christians today believe that such blind superstition, oppression and persecution was stopped with the Renaissance and the Protestant Reformation between the 1300s and the mid-1600s, that is not true. It was not stopped. And it has in fact been revived in America. That's why Americans now need to learn or remember what Benjamin Franklin, a Deist and Freemason, stated in an essay on "Toleration": "If we look back into history for the character of the present sects in Christianity, we shall find few that have not in their turns been persecutors, and complainers of persecution. The primitive Christians thought persecution extremely wrong in the Pagans, but practiced it on one another. The first Protestants of the Church of England blamed persecution in the Roman church, but practiced it upon the Puritans. [The Puritans] found it wrong in the Bishops [of the Church of England], but fell into the same practice themselves in New England [in America]." That is quite true, because that is what happens when you have an authoritarian theocracy based on a misguided and distorted idea of "religion." Persecution is usually perpetrated by spiritually blind men who think they are "holy" and "godly" and deserve to rule, and they deal harshly and sometimes violently and lethally with anyone who stands in their way. At the very least, they slander and condemn those who criticize them or refute their claims to "divine" authority. In fact, in the late 1700s, misguided, theocratic "Christians" even slandered the Founding Fathers of the United States of America, because most of the Founding Fathers were Deists and many were Freemasons, like George Washington and Benjamin Franklin. They wanted to establish freedom of religion, and freedom from religious bigotry and theocratic imposition. But misguided, right-wing theocratic Christians didn’t like that. In fact, they fought against it. More to the point, Jefferson also wrote: "The returning good sense of our country threatens the clergy and they believe that any portion of power confided to me will be exerted in opposition to their schemes. And they believe rightly; for I have sworn upon the altar of God, eternal hostility against every form of tyranny over the mind of man. But this is all they have to fear from me, and enough too in their opinion, and this is the cause of their printing lying pamphlets against me. . ."
Most of the founding fathers, and later even Abraham Lincoln along with many other reasonable, fair people, felt the same way. But, unfortunately, with respect to the need for religious pluralism and equality, the influence of the Founding Fathers did not last for long. Aggressive, theocratic, right-wing conservative, authoritarian Christians gradually negated that pluralistic influence, and there have been times when they have been politically aggressive. A very notable time was in the mid-1930s, when misguided, power-hungry, right-wing Christians asserted themselves in America. They fought against the success of the good liberal progressives like Eleanor and Franklin D. Roosevelt, Woody Guthrie, Pete Seeger, Joe Hill, Paul Robeson, Josh White, Dorothea Lange and growing numbers of others who were promoting the cause of freedom, liberty, and justice for all. At the same time in the 1930s, Adolf Hitler was rising to power in Germany. He too claimed he was a Christian, in speeches and in his book Mein Kampf. And he eventually got his Nazi thugs to persecute and even imprison and murder Jews, Freemasons, Gypsies, Homosexuals and many other groups who were judged "inferior" or "ungodly." In American the right-wing Christians were driven by the desire to establish more firm "Christian" control in the United States, and they founded a so-called "Legion of Decency" designed to do that. It consisted of right-wing conservative denominations, sects and factions much like those that today make up the "Christian Right" and what they call a "Moral Majority" or "Christian Coalition" or "The Family" or the "Heritage Foundation" and all sorts of other misleading names to make them sound good. 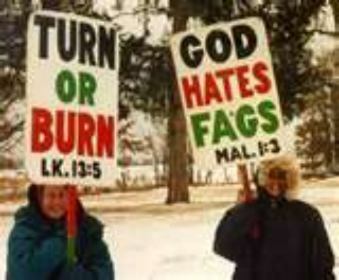 The hypocrites think they are the true Christians, but they ironically act in opposition to true Christians. After all, as is explained in the articles About Christianity, Sheep vs Goats, and True Spiritual Values, true Christians do not judge their fellow human beings harshly, nor do they condemn people or cast stones. True Christians actually try to love even their enemy, and they care for and/or advocate for the vast majority of our brethren, especially the poor and the least of our brethren. False Christians do the opposite, in cahoots with the forces of greed and self-interest who serve Mammon, not God. 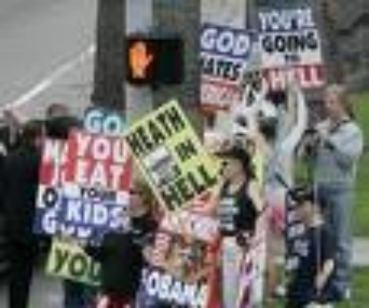 The hate speech of the American Christian Right has led to some horrible consequences because its leaders judge and condemn people as "godless" or "evil" or "ruled by Satan." In spewing such false accusations, they not only cast aspersions, they cast stones. They totally ignore the words of Jesus advising them to judge not, lest they be judged; to resist not evil but love good (if they are tempted to judge), and love even those they judge as their enemy. Again, as the leaders of the Christian Right would say, it was not them but madmen who committed the crimes and murders. But they do not understand that it has been their hate speech that influenced the madmen — just as it has been the hate speech of "Muslim Jihadists" and "Jewish Zionists" that has caused misguided Muslims and Jews to commit murders and atrocities in the name of religion. Even though the leaders of the American Christian Right can no longer arrest, prosecute or imprison "heretics" or burn them at the stake, they still judge, slander and condemn them. They have put forth many ridiculous and outrageous conspiracy theories, which are debunked in the articles on The Fall of Babylon and The Anti-christ, which expose the false ideas of the false prophets. It is crucial that the truth be known, because the hypocrites and false prophets wage their New Inquisition in speeches, on "conservative" talk shows, on "evangelical" television shows, and on Internet sites, spreading lies, spewing hate, and poisoning the minds of their misguided blind flocks and leading them to think they are superior and "holier than thou" merely because they "profess that Jesus Christ is Lord and Savior." So, do not be fooled. They betray God. They betray Jesus. And they betray the Founding Fathers of America. The truth is that the humble, gentle, peaceful and "meek" majority of people in the world shall inherit this earth, and that will be just as soon as all the proud, aggressive, militant groups stop fighting for power over each other in the name of "religious mandate" and "divine right." God wants us to love one another, share with one another, care for one another, and make peace, not by waging war to try to "win the peace," but by actually making peace. But there will be not peace until the hypocrites are rendered contrite of spirit in the face of truth and righteous judgment.